A recent article in the New York Times by Eduardo Porter (here) points out that if one considers only carbon dioxide emissions (CO2) from the combustion of fuels, then worldwide emissions have been flat for 3 years in a row. Figure 1. Source: International Energy Agency, 2017b. Emissions from fuel combustion may be the best estimate of worldwide emissions available. They constitute the largest percentage of emissions, and it is virtually impossible to inventory how much methane is being released by every bog or permafrost around the world, or how much nitrogen oxide from farm chemicals, etc. Figure 2. Source: Earth Systems Research Laboratory, 2017. In August I posted that the American Meteorological Society reported that in 2015 the concentration of CO2 in the atmosphere averaged above 400 ppm for the first time ever. It was my opinion that this was terrible news: 400 ppm was something akin to a threshold we needed not to cross in order to avoid the worst effects of climate change. We crossed it decades before anybody thought we would. Further, the concentration of greenhouse gases was continuing to increase, and the rate of increase seemed, if anything, to be growing over time. Figure 2 repeats the chart showing the trend over time. How can one reconcile that post with the new findings? Imagine you are on the Titanic, and an hour ago the ship struck an iceberg. The ship’s crew happily reports that the amount of water getting into the ship is no longer increasing minute-by-minute. Well, that’s nice to hear, but water is still pouring into the ship, and unless you can stop the water getting in, the ship will still sink. The CO2 situation is similar, but in reverse. The rate at which the world is putting CO2 into the atmosphere may not be going up, but we are still putting billions of tons of it into the atmosphere every year. It is more than enough to cause climate change. We don’t need emissions to flatten, we need them to decrease to a fraction of what they are today. 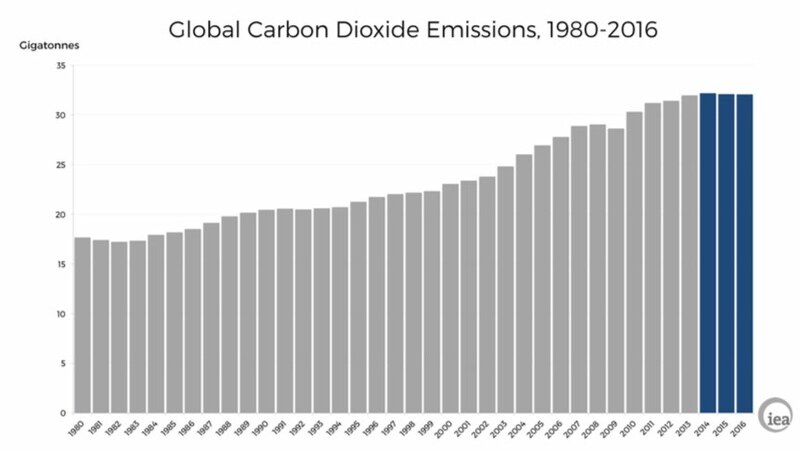 So, it is good news that worldwide emissions have not grown over the last 3 years. Perhaps it even tends to validate the efforts we’ve been making: maybe moving away from fossil fuels, especially coal, has helped stabilize emissions. But we have a long way to go before we stop this vessel of ours from sinking. Earth System Research Laboratory. 2017. 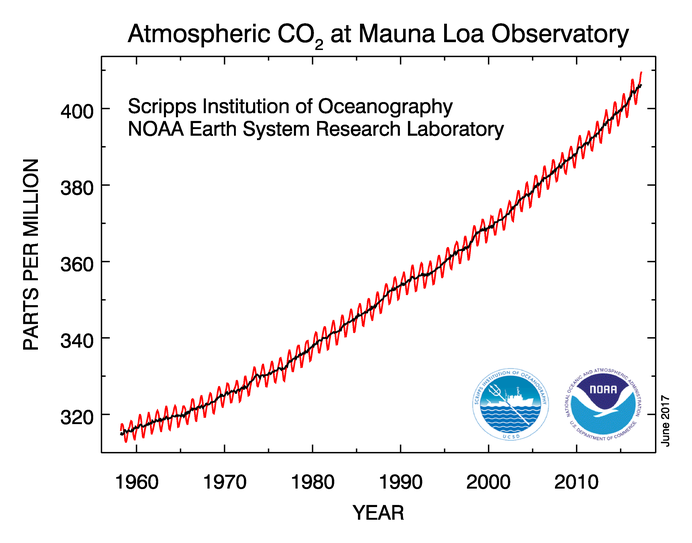 Full Mauna Loa CO2 Record. Downloaded 2017-06-15 from https://www.esrl.noaa.gov/gmd/ccgg/trends. Global Carbon Project. 2017. Global Carbon Budget: Summary Highlights. Viewed online 11/15/2017 at http://www.globalcarbonproject.org/carbonbudget/17/highlights.htm. International Energy Agency. 2017b. IEA Finds CO2 Emissions Flat for Third Straight Year Even as Global Economy Grew in 2016. Downloaded 2017-11-09 from https://www.iea.org/newsroom/news/2017/march/iea-finds-co2-emissions-flat-for-third-straight-year-even-as-global-economy-grew.html. By mogreenstats in Climate Change, Greenhouse Gas Emissions on 2017/12/07 .